Summer vacation is a great time for students to get out of their comfort zone, learn new things and get creative but it’s also a time when academic development declines. 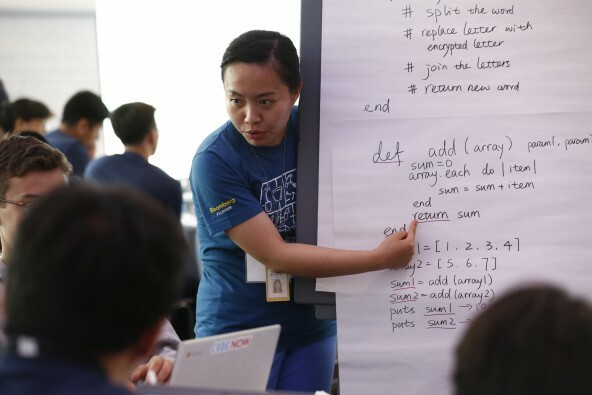 To prevent “the summer slide,” Bloomberg hosted 100 public high school students at its global headquarters in New York City for a three-day coding camp with CodeNow. CodeNow is a free, out-of-school computer programming training organization that focuses on increasing the presence of underrepresented groups in the tech industry. CodeNow believes underrepresentation results from a lack of opportunity, and workshops such as CodeNow in a Box bridge this educational gap by exposing students to computer coding, critical thinking, and problem solving. Their largest training to date, over a three day period Bloomberg employee volunteers hosted and trained the 100 young men and women who came to the session with minimal-to-no prior computer coding experience. With additional support from CodeNow alumni-turned-trainers, students learned the programming language Ruby through trainer-led activities and coding challenges with their peers. The challenges included digital game building, as well as message encrypting and decrypting. 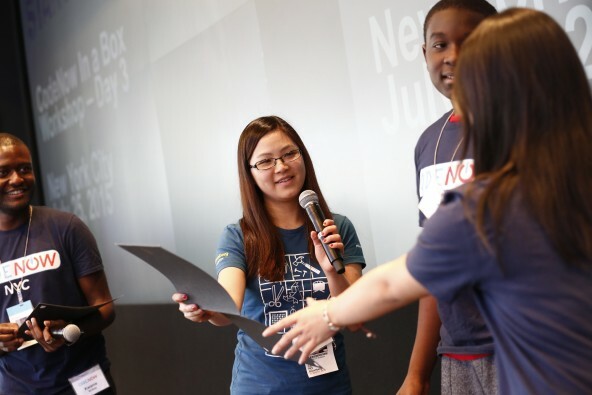 Last year, CodeNow launched its national CodeNow-in-a-Box program, bringing coding workshops for high school students into corporate environments. As its first corporate partner, Bloomberg has hosted nearly 200 students at its headquarters since October as part of the Bloomberg Startup program. Bloomberg Startup, our signature education engagement program, offers year-round mentorship, technical and professional development workshops geared towards college and career readiness, arts programming, and service opportunities. Our related partnership with CodeNow provides students with networking opportunities, industry exposure, and helps increase their confidence to pursue personal aspirations. There are over 4,000 technologists at Bloomberg who define, architect, build and deploy complete systems and solutions every day. CodeNow partners with leading technology organizations, like Bloomberg, all year round to help bring coding to students who want to learn this critical skill set. For more information on the organization and how to get involved in future workshops, visit http://www.codenow.org. At the end of the program, 97% of students said they are interested in continuing to develop programming skills and 88% are considering Computer Science as a college major.